Pictured left to right are the writers who read from their works at the luncheon: Jeri Board, Laurie Ross, Claire Wharton, and Savannah Marino. On Saturday, March 6, 2010, six of Polk County’s published writers, plus a poet and a high school student, shared their works and their creative worlds. 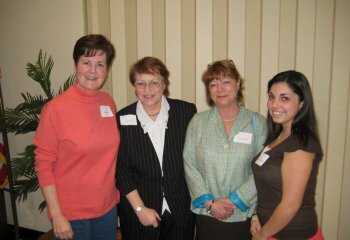 Four of the writers opened their writing world to AAUW members and friends in a version of a “Round Robin” event. Participants visited two offices in the morning and two in the afternoon. A special Luncheon was held midday during which two novelists, a poet, and a local high school student read from their works. The board of Tryon Area AAUW notes, “We were thrilled at how all the writers’ knowledge and experience were so enthusiastically received.” The proceeds from this first-time event go to the Eileen White Scholarship Fund which furthers the education of women twenty-five and older seeking economic self-sufficiency.